Formed in 1989 from the embers of the Rigid Containers Youth Band after funding was withdrawn, an intrepid group of parents, led by the father of the then principal cornet (Marcus Pain), Eddie Pain set out to form the “best youth band in the world”! In the second week they were joined by the highly acclaimed young trombonist Chris Jeans as the band’s conductor. It was a bit of a shaky start with only about a dozen players, but undaunted early in 1990 the band took part in the European Youth Championships and The National Entertainment Youth Championships of Great Britain, with such a small band – only one tuba! It was more in hope than expectation that the band travelled north, but what the players did realise is that contesting is very exciting! Back in those early days the band’s uniform was a secondhand traditional band jacket, purple in colour and stank of mothballs! They were so bad that it was decided to just wear white shirts and bow ties for the Action Research National Entertainment Championships in Blackpool . We had to make a change!! Committee member Jean Cherry (Chris Jeans` Mother in Law to be) knew someone who knew someone else who knew someone who could get some very nice material from Italy . They supplied some with spots on and some with stripes and after much deliberation it was decided to combine the 2 and off it went to a tie manufacturer in Corby, (Daracane I think) for them to come up with the design. The rest as they say is history. The very next year the band surprised everyone – including the players themselves – by winning the Action Medical Research National Youth Entertainment Championship in Blackpool! Over the next ten years or so it went on to win that same Championship three more times, taking many soloist prizes along the way. (Helen Casewell, Fiona Casewell, Paul Marshall, Peter Collins, Matt Gee, Steve March, Tracy Colston, Ed Benetts) Also, the band became British Open Champions, in those days held at the Pontins Holiday Camp Prestatyn, and finalists in the Radio 2 “Youth Band of the Year”. After several attempts to enter the National Youth Brass Band Championships (The Nationals) – a contest which always clashed with the very important National Youth Entertainment Championships – the band finally entered the intermediate section. For four or five consecutive years the band was awarded Gold Standard, until it eventually won the section, and became the Intermediate National Champion Band! Meanwhile, in 1999 and 2000 the band was selected to represent England at the European Championship in Edinburgh. 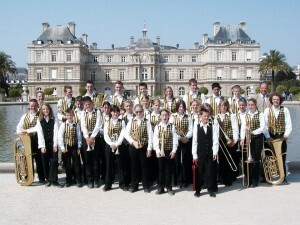 For two years running the band was placed 2nd overall, winning the “most entertaining band” prize, and seeing Peter Collins crowned the European Youth Champion soloist. Around 2000 the band had to vacate its home of East Carlton Village Hall. The old wooden building had been condemned and was about to be pulled down. The search was on and eventually we moved 2 miles down the road to Wilbarston Village Hall where we remain to this day. The new millennium saw the band move up a league, winning The Action Medical Research National Entertainment Championships of Great Britain three more times, the British Youth Open three times, the French Open Youth six consecutive times, the Butlins Mineworkers’ title six out of seven years. In 2013 the band was crowned BBC Youth Band of the Year and eventually, in 2014 the band was crowned the Champion Youth Band of Great Britain. The band has now completed the Hat Trick by winning again in 2015 and 2016, resulting in the band being invited to represent England at the European Championship, fifteen years after the first time! In the new era, our soloists have continued to win individual prizes - Alice Norman, Jacob Phillips, Sarah Lenton, Matt Letts, James Fountain, Thomas Fountain and Siobhan Bates who incidentally is the 2016 European Solo Champion. It is also worthy of note that our band has consistently had a higher representation of players in the National Youth Brass Band of Great Britain than any other band. Each year the band continues its tradition of embarking upon a European Tour, having travelled to France, Belgium, Luxembourg, Holland, Germany, Austria, Italy and Spain over the years. The band also has a collection of sixteen CDs to its name. As with any youth group, there have been many changes of personnel over the years. The vast majority of our players continue to play once they leave the band, and some have gone on to become professional musicians, a few of which are now household names in the world of orchestras and brass banding! The band has now been in existence long enough to be able to welcome into its ranks the offspring of former players! These days, there is a whole new group of intrepid parents all working together in what can only be described as a very professional team. We have a state of the art website with an availability system that really works and we are now of course a registered charity. There are two things that certainly haven’t changed over the years. One is the band’s desire to entertain and to perform music at the highest possible level. The other of course is that the band is so lucky to enjoy the enviable talent of that young trombonist Chris Jeans, who has now been Artistic Director of the band for an amazing 27 years! (at the time of writing in 2016) This is the longest unbroken partnership between any band and conductor anywhere in the country, and it is this partnership that makes Youth Brass 2000 so special. The ambition of that group 27 years ago was to become “the best youth band in the world”. Did it succeed? I think so! Don Collins – band chairman 1995-present.